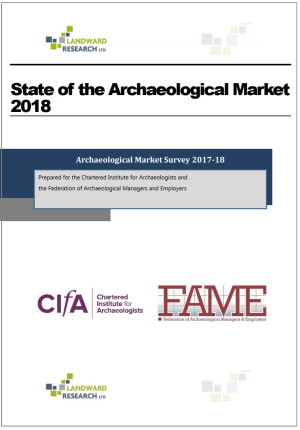 The CIfA and FAME have announced record Levels of Commercial Investment and Employment for Archaeologists in the UK as the latest Archaeological Market Survey report is now available. In financial year 2017-18 the sector grew in terms of the number of employees, financial turnover, and profit levels. The overwhelming majority of income came from private sector clients (83%, a slight increase from 81% in 2016-17) with residential housing as the biggest sector, but infrastructure projects were also important. The Archaeological Market Survey report provides a unique analysis of the archaeological sector as part of the overall UK economy, and is based on survey responses from FAME members and CIfA Registered Organisations. The report was produced by Landward Research on behalf of Historic England, the Federation of Archaeological Managers and Employers (FAME) and the Chartered Institute for Archaeologists (CIfA).